Yep! I know all I do from letsplays. Also, thinking of doing the stream tonight. Check KJ for the details why I didn't do it last night. Full version better. Winches, lazors, lifting balloons, manipulator arms, wheels and tank treads, all sorts of fun stuff when you get mods involved. AdvancedSAS is in the demo. Press t to activate, I think. 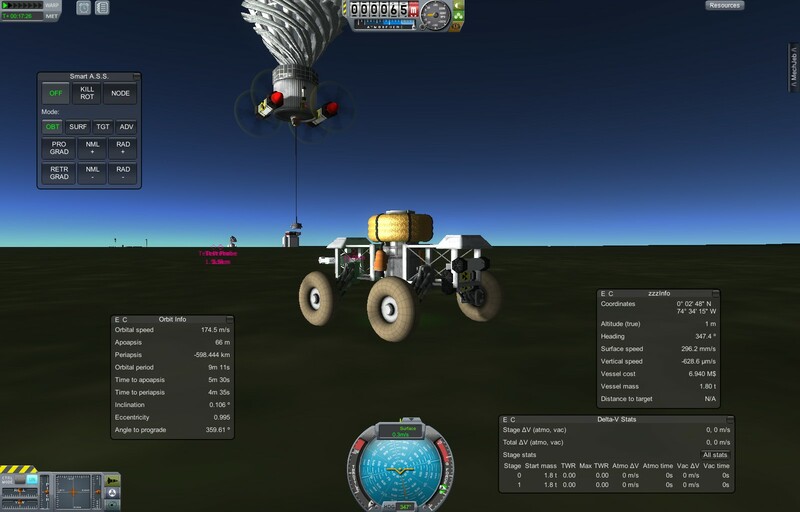 I have a blimp travelling 260m/s towards the south pole of kerbin, generating more fuel than it uses along the way. Its mission is to scan the last kethane hex my satellite can't get at. I love the mods ksp has, they're so awesome. And I had a truck carrying an orange tank full of fuel, travelling at about 200 kilometers an hour towards KSC2, having just picked up a converted Kethane load. And then I started a new save, because I updated a mod or two. I should start playing seriously again. Hmm... it might be interesting to get a community space station going, or something. Everybody designs a module and sends that ship to a person, who then flies it into orbit and assembles it all. 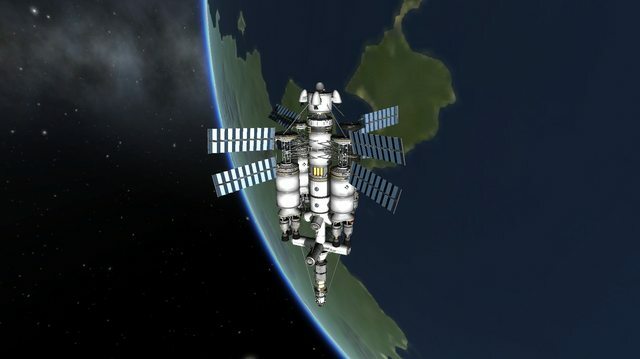 I give to you all the nearly finished Hermes Station! - Must have a docking port on the top and bottom centered on the center of mass. This is so I can stack them on top of each other. I also need two shuttle designs for the same reason as the probes. - Leave the docking port out, I'll add them myself to make sure there are no collisions. Thanks everyone for helping out! I'll be doing a stream of more construction tonight at 8:45pm EST tonight 'till about 10:15pm. Would this be stock only, or are mods allowed? As Melfice asked, stock or mods? What kind of probe? Rover or just a drone to act as a beacon? Any planet or any planet/moon? I've got a little rover with ~700ms/s deltaV (820 if no chutes), RTG powered driving range, kethane detection, and frankly unnecessary symmetry (dual kethane detectors, dual asas, dual mechjeb). Or, if the CoM doesn't have to be exactly perfect, 22 parts, 1.8T, 733ms/s deltaV. Modding KSP is easier than modding vanilla minecraft. They already have a modloader built in. So you just pick the mods you want and extract the zip files into the gamedata folder. Each mod has its own folder, packed with whatever they want. Mechjeb - Lots of performance data, maneuver node calculations, and autopilot functions. Alarm clock - Setup alerts so you don't have to babysit each ship between stable orbits. Crew Manifest -Add or remove crew on the launchpad, and transfer crew between parts without having to eva. Lazors - Adds a camera view to docking nodes and some special laser systems for resource transfer between ships, remote control, ect... Has some addons, like a placable camera, missiles, a laser turret, and manipulator arms. Firespitter props - Helicopter and prop plane parts. The electric prop is especially nice. Kethane -Scanners, drills, and processing for a new resource. Mine kethane from pretty much any planet or moon and covert it into fuel, oxidizer, monoprop, and xenon. Extraplanetary Launchpads -Uses the kethane resource system to add ore deposits. Mine ore, smelt to metal, covert to parts, and finally construct ships on other planets. I've tweaked mine to use the kethane drills to get metal. H.O.M.E. -Large, nicely animated deployable modules for setting up bases on other planets. Includes a nuclear powerplant and an admin module that can generate fuel and oxidizer from intake air. KAS - Winches, grapple hooks, and anchors. Makes it easier to dock stuff in orbit if you can just have a kerbal feed a line out to a ship then tow it into place. B9 aerospace - Lots of jet parts. Includes vtol engines and a hybrid engine that swaps between air and oxidizer usage. Caterpillar Tracks - Tank treads. Damned Robotics - Parts that make your ship sections spin, bend, and move. Hexcans - Standardized part sizes/shape for resources. Includes some nice RTGs and a ballast called barite (transfer between tanks to shift your center of mass). Edit- Ok, so the zip finished at 178meg. Not going to put it up for download but I can pass it along if you want luke. If it is that simple then I'll try, ya sure!! If I'm going with those then the probes / shuttles have to be self contained to work (I.e. if it's a kethane ship it has to be able to perform everything kethane related on its own). Thanks for those links Neo, I'll get them all from those, thanks Forrest the offer though! Have a look at TAC Fuel Balancer as well! It's almost essential for shuttles and other aircraft since the mod draws fuel from all tanks, maintaining the balance of the ship. That would be nice, I'm planning on building a "jetcan" rocket similar to what Luke's been doing, only simpler. Kethane all in one landers are easy. You already have power and fuel storage on a ship, just add a small kethane tank, a drill, and the medium converter. A detector is only needed if you haven't scanned already. What is the goal of your game? There are probably other mods that would fit, no matter what it is. Every planet explored with the grandest star ship ever known! Edit 2: Yay!! The mods seem to work! Feel free to send in ships with those mods! Edit: Never count on MecJeb, brakes everything. Hey Neowulf, I'd like to have that zip if you don't mind. I seem to miss a lot of the good mods when I look for them on spaceport. The station is 100% finished and is ready for the probes and shuttles!! In the mean time I'll see about sending a few probes out. I'm pretty sure there is an updated dll in that thread that fixes some problems. Mine works just fine for most things (rendezvous planner works with orbital transfers up until the match velocities, do that part manually). Though what kind of computer do you have? Mine has 4gig of ram and a 9800gtx+ video card, and if I put another big part pack in it starts to screw with textures and crash on me. Working on swapping my video card out right now (upgrading to a 3 year old radeon from a 4 year old geforce, really moving up in the world! ), but when I'm done I'm going to add the fuel balancer and a pair of ducted electrical fan engines I found today. Once I'm sure they work nice I'll repackage, upload, and send you a link. You're adding a fuel balancer to your computer? Of course. How else am I going to keep the CPU from flaming out when I accidentally dump all the ram into the GPU? I've already buzzed the tower.